It’s berry picking season. There is nothing better than strolling to the wild vines at the back of our property and plucking fresh, warm, untainted berries from their spiky perch. Except maybe, the lemonade one can make with those berries. It will never cease to amaze me how excited the kiddos get about going out to pluck a handful of fresh berries or climb the tree after cherries. I don’t even mind the purple and red stained hands. 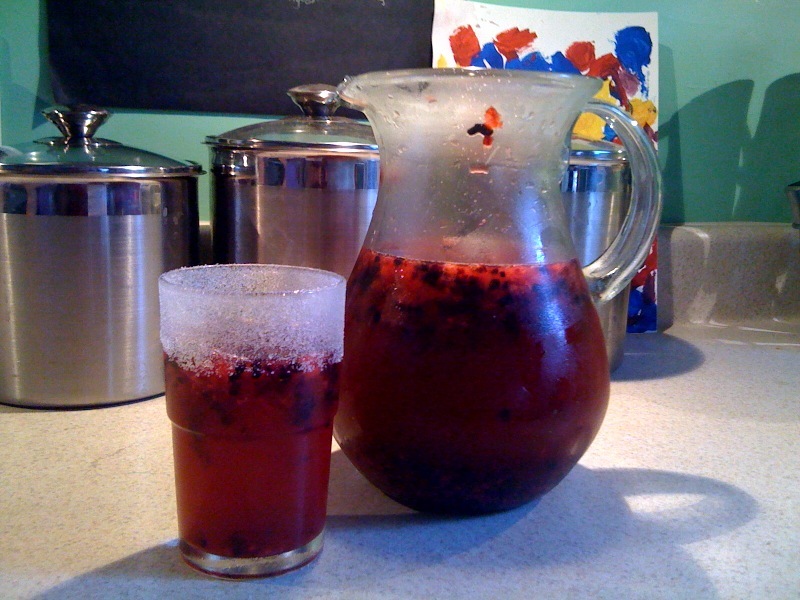 The photo is our fresh pitcher of berry lemonade made just moments ago and already teetering on the edge of emptiness again. This batch was made with blackberries and raspberries which had gotten a little soft over the last couple days. Here’s the lemonade recipe, which is of course Raw… see eating Raw isn’t hard at all. Allow berries to sit out to get a little warm and mushy/juicy. Once they are nice and squishy, place in the bottom of your pitcher. Take a wooden spoon and squash them up. Add lemon juice and keep squashing. Add your honey and water. Mix well. Enjoy! I used this recipe as a beverage in the 4-h food show .Our theme was a picnic and the drink was just perfect! The judges adored it and even had thirds!We won best of show aswell!Thanx so much, 🙂 <3 it!